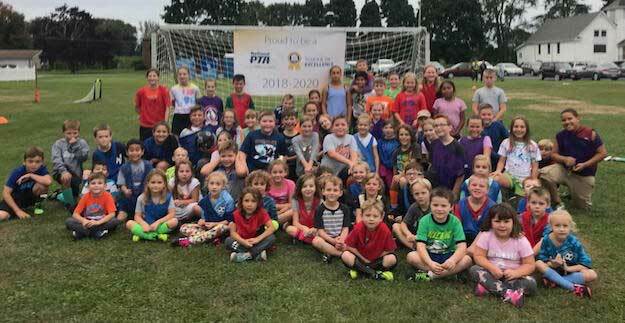 LYNDONVILLE – National PTA has recognized Lyndonville Elementary School and Lyndonville Centralized PTSA as a 2018-2020 School of Excellence for their commitment to building an inclusive and welcoming school community where all families contribute to enriching the educational experience and overall well-being for all students. Lyndonville Elementary School and Lyndonville Centralized PTSA are one of only 278 PTAs and schools nationwide recognized as a 2018-2020 School of Excellence. With the help of staff and parent support, Lyndonville Elementary School hosted a February Boost and nearly 100 students attended school on the Wednesday over February Break. Staff members worked with students on a variety of hands on STEM (Science, Technology, Engineering & Math) based projects. Through the Lyndonville PTSA, we began a Watch DOGS program at school, which is designed to increase positive male role models at school. Mr. Vern Fonda, Lyndonville Centralized PTSA President, was instrumental in getting this program up and running, helping the PTSA to host Donuts With Dads and Pizza Party events to get male volunteers to take an active role at school. Extra-curricular activities were also increased at Lyndonville Elementary last school year, through the support of our PTSA, community and staff. The elementary school showcased a K-2 mini-musical, 3rd & 4th grade chorus, soccer club, Minecraft Club, Taekwondo Club, 4H, storytelling and extended ages for After School Reading Program! Special thanks to Cornell Cooperative Extension, Yates Community Library, the Lyndonville United Methodist Church, OCALS and Kwandran’s Taekwondo for their help with these initiatives! To celebrate their achievements, National PTA presented Lyndonville Elementary School and Lyndonville Centralized PTSA with a National PTA School of Excellence banner. For more information about the National PTA School of Excellence program, visit PTA.org/Excellence.